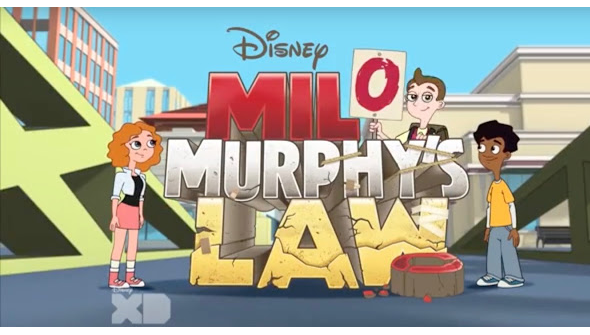 The intro sequence for Milo Murphy's Law has premiered online and appears to be promising for the freshman Disney XD series debuting this fall. Created by Dan Povenmire and Jeff "Swampy" Marsh, the creative minds behind the highly successful Phineas and Ferb, the series follows young Milo Murphy who is just about the unluckiest kid on the planet. If you recall, Murphy's law touts that anything that can go wrong will go wrong and for Milo everything does just that. You would think that this would make him a sour and embittered kid, but Milo is the exact opposite of that. He exudes an optimistic and cheerful spirit in the face of everything going wrong for him and appears to be well prepared for anything that is thrown his way. Featuring a theme song performed by Weird Al Yankovic, who also happens to be voicing the titular character, the intro is incredibly catchy while also wildly wacky. Time will tell if Povenmire and Marsh can replicate the success that they had with Phineas and Ferb, but our bet is that this series will match, if not exceed our expectations. You can catch Milo Murphy's Law on Disney XD starting on October 3. In the mean time, check out the intro sequence below and let us know what you think!